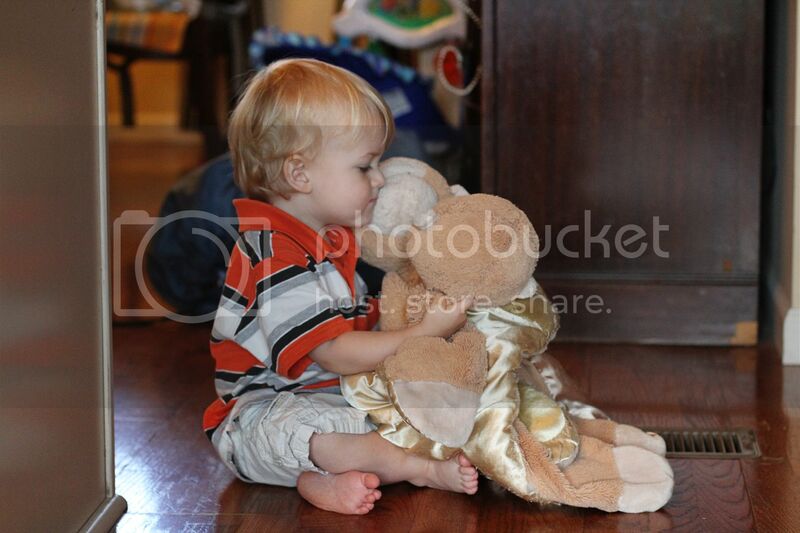 His monkey, which he lovingly calls "Ee ee ah ah," even though I'm confident he could say "monkey." We have two of these monkeys for when one is lost or dirty--and for awhile he had possession of both. I think he forgot about the second one and we are back down to just one. 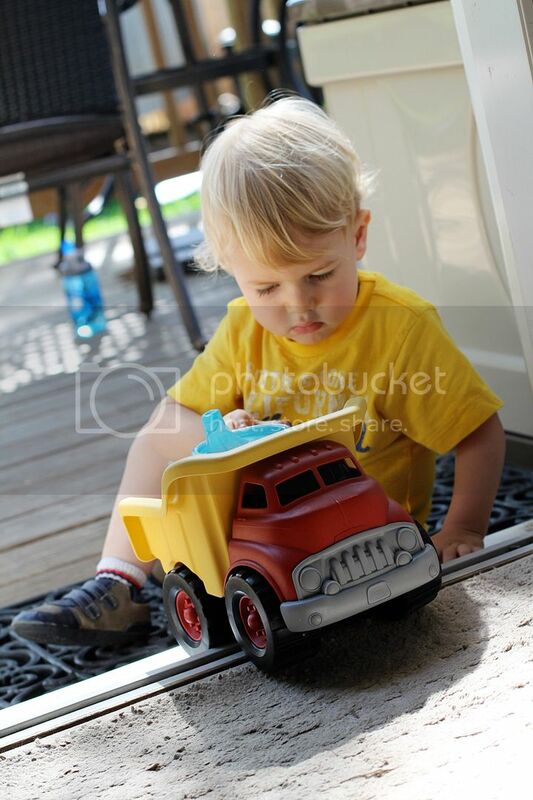 He loves trucks and cars. We like to try to figure out how little boys learn to love things like trucks and helicopters and ambulances--he loves to drive them and points them out obsessively in the car. His favorites are steam shovels, bulldozers, school bus, mail trucks, dump trucks, mixer trucks, trash trucks, police cars, helicopters, fire trucks, ambulances and taxis. That's just about everything, right? Sometime I need to record him saying all their names because it's funny. This dump truck in particular he insists on sleeping with occasionally--the way he cries for his "dump truuuuuuuuuck" is precious. He loves singing while he runs around. It's so fun to watch him learn and be able to sing songs and figure out how to work all his limbs. He's starting to climb things and have some pretty fancy footwork. 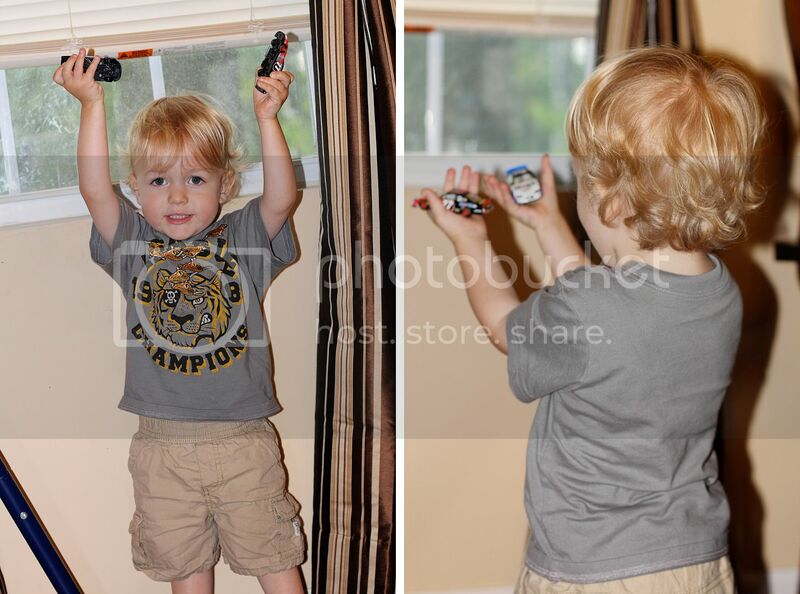 And here is a trifecta of favorites--his race cars, his tiger shirt covered in Exxon tiger stickers, and his curls. Wait--it's me who loves his curls... not him. Also on his favorites: TORI and the pool. 1. I love the re-design. I'm particularly obsessed with the header photo. SO cute! 2. Please invite me to join Pinterest. I have a feeling I might regret it, since I already spend too much time on the internet. But what the heck. 3. Finn's curls are darling. So is the fact that he still loves the monkey. 4. Need to see you all soon! i am confident i would also be his fave if i fed him one of my famous poop discs. for those of you who don't know me, i'm not a creep.